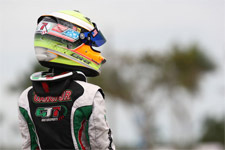 After earning race wins at the Florida Winter Tour, ROK Cup USA series, and Rotax Summer Shootout, championship podiums at the Florida Winter Tour and SKUSA Pro Tour, and championship titles in the ROK Cup USA series and United States Rotax MAX Challenge Grand Nationals, top karting talent Anthony Gangi Jr. recently wrapped up a rigorous and exciting end to his 2015 racing season. 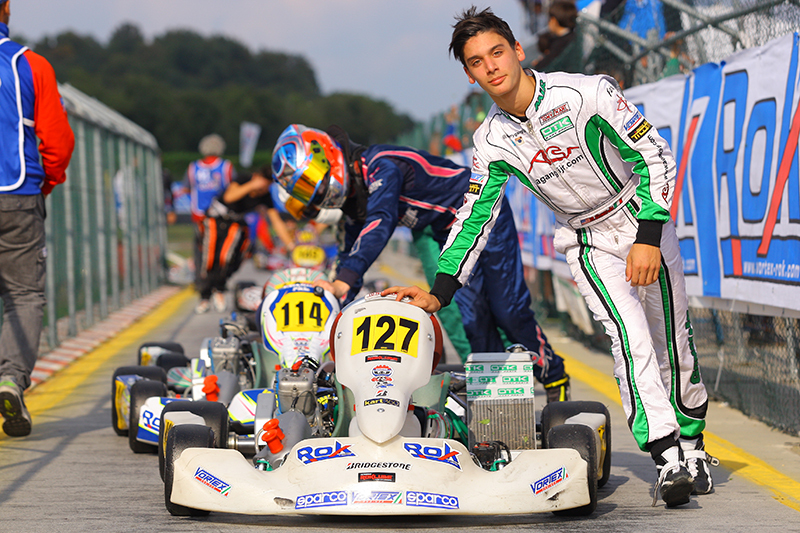 Finishing up the final races on his 2015 calendar, Gangi Jr. headed to Europe two times, representing Team USA at the ROK Cup International Final and the Rotax MAX Challenge Grand Finals. 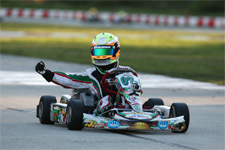 First traveling to Italy in October for the ROK event as the ROK Cup USA Junior Champion, the Brookville, New York resident was met with a challenge. 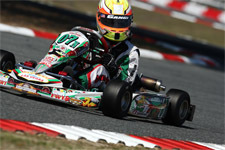 Grip issues plagued Gangi Jr. in Portugal as well, this time for the Rotax MAX Challenge Grand Finals, which he qualified for after taking his third United States Rotax MAX Challenge Grand National title. 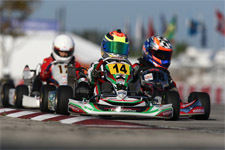 Becoming the first driver to earn US Rotax National titles in the Micro MAX, Mini MAX and Junior MAX class, the karting phenom earned his berth on Team USA in the prestigious international competition. Gangi Jr. would then complete his 2015 racing season at the ultra-competitive Superkarts! USA SuperNationals at the Las Vegas Convention Center in Las Vegas, Nevada. Hungry for ultimate SuperNats glory, Gangi Jr. showed everyone what he is capable of by clocking pole position in the 70+ strong TaG Junior class. Controversy ensued in heat one, where Gangi Jr. received an unjustified penalty. No mechanical black flag was waived for a cracked fairing on the #07n Tony Kart/GT7 Motorsports entry, with officials imposing a DQ upon the conclusion of the heat. 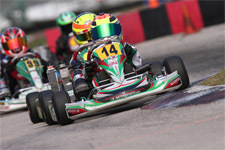 Reduced to a five-position penalty, as opposed to the win, Gangi Jr. started the main event on the outside row in the fourth position. An unfortunately timed green flag for the start, with a good part of the inside row ahead, led to a crash for Gangi Jr. costing him the win. The young talent did clock the fastest race lap while passing, ending with a top-ten finish in eighth. Additionally, chosen as one of the 12 finalists for the 2015 Mazda Road to Indy Driver Advancement Program in conjunction with Andersen Promotions and MAXSpeed Group, Gangi Jr. was ultimately not picked as one of the four winners. However, he would like to extend his congratulations to those who were. With Gangi Jr. having an incredible experience abroad and looking for a new challenge, the future star is pleased to announce he will contest the full 2016 racing season in Europe. 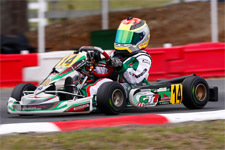 Set to compete in OK (Senior) in both WSK and CIK competition with Ward Racing, Gangi Jr. will stay aboard the familiar Tony Kart chassis with Matsuura Masanori as tuner. None of this would be possible without all the continued support Gangi Jr. has received all year from his team, crew, sponsors and supporters. Thank you to Mike Doty, Matsuura Masanori, Chad Brakens of Race Data Dynamics, Daniel Lambert (Disco Dan), Daniel and Gary Woltjer of Woltjer Engines, Nate Grindell, Mike Speed, Alex Speed, Mario Ioffredo, Jorge Arellano and everyone at OGP, GT7 Motorsports, Millwork Solutions, Holeshot Chains and Sprockets, PKT, and Hot Head Engine Preheaters.